Sorry guys, much like Teisel settling his debt with Lex Loath, this one’s a day late and a refractor short. The highbrowed leader of the air pirates who shoulders his responsibilities seriously! Teisel is the oldest son of the three siblings, and therefore the support pillar for the Bonne family. At times he seems a bit rough around the edges, but when push comes to shove he’s actually an excellent tactician and a fair sport. Because his body is so large and powerful-looking, you might expect him to be a tough guy who’d use force as a solution to everything–but perhaps looks can be deceiving!? It seems he’s actually the intellectual type! He dreams up all sorts of plans and schemes, however they don’t always meet with success. Teisel is this kind of guy!! The older brother who the other air pirates depend on for guidance!! He takes charge of his younger sister and brother, as well as the 40 kobuns, and directs them in their roles as sky pirates. When his family takes a wallup, he won’t take it lying down! Teisel is staunch believer in brotherly love, and gets even more worked up about the defeats of Tron and the others than he gets about his own losses. Surprisingly, he’s actually a bookworm! He’s also a huge fan of anime! Teisel’s room is covered with books, with subjects ranging everything from business principles to manga. To help cope with the sadness of his parents’ death, Teisel has become a total anime enthusiast! A cool strategist who can calmly plot out battle plans! Teisel is far brainier than he appears. Drawing up precisely detailed scenarios, he always strives to keep his family out of serious danger. A highly skilled pilot of mecha!? Teisel often uses his mind as his weapon, but in times of combat, he shows a whole other side of himself! Taking great pride in his operation of their airship and giant mechas, he also likes to take the lead when it comes to plundering treasure. Post-operational meetings are a must!! Never wanting to make the same mistake twice, it’s Teisel’s style to hold a review meeting after the end of every operation. By assessing their strengths and weaknesses, the Bonne Family will grow to be the best. The Road to Creating Teisel!! The image of Teisel as a tough muscular character who’s actually a sophisticated intellectual didn’t change very much in concept. Even though he’s supposed to be a villain, he’s somehow impossible to hate. Thick-looking goggles, a large nose and a turned-down mouth are the central features here. The skull markings on the shoulders are another key point. Though very close to the final version, his lower body is still a bit too long and thin, giving a younger appearance. With those eyebrows, he started looking considerably older. He looks almost like a robot, doesn’t he. Teisel is definitely a fan favorite. In English his role was brought to life by Rob Smith, a role that many hope he will reprise in Legends 3. His unusual delivery of many of the game’s most hilarious lines was certainly very memorable for me in my first time playing. 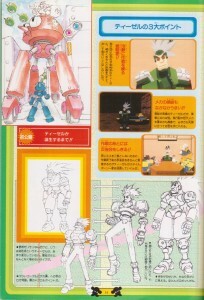 The concept sketch on the top left shows Teisel and Tron piloting a very early version of the Feldynaught (aka Ferdinand), with equally early versions of the Draches in the background. Teisel is always trying to be strong for the rest of his family, ever since the loss of their parents. Underneath that hard but likable and driving personality lies a man who still loves the things from his childhood. I think everyone who grew up with the Mega Man series and still sees the magic in it can identify with Teisel. 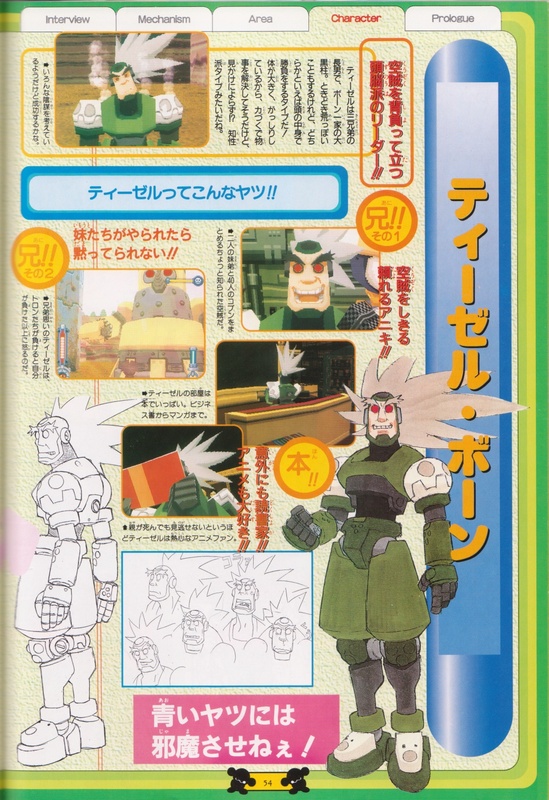 5 Comments to "A T. Bonne to Pick"
There’s some design ideas for an evil Rockman character, but they are nothing like Juno. 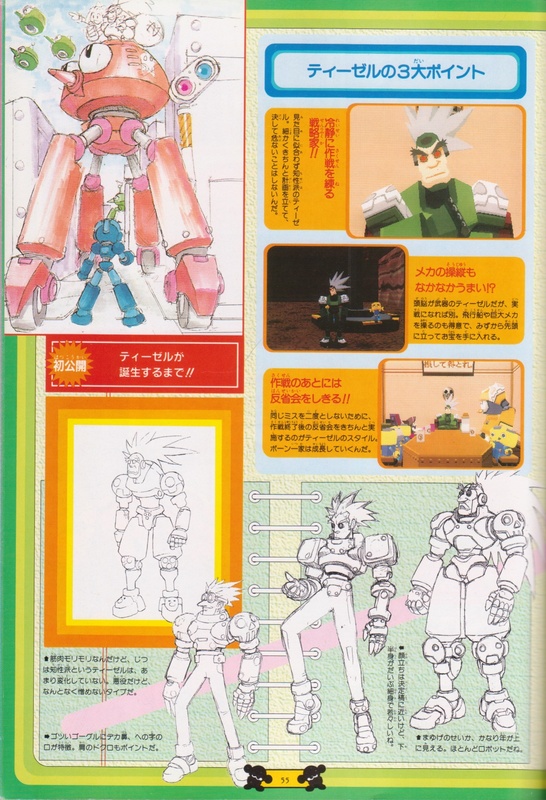 I know there’s some colored pencil art for his first and second form in V-Jump’s companion game guide book though. Which would you rather see next week: Bon Bonne, Juno, or evil Mega Men? Juno, I suppose. Been trying to find more stuff on him for a while. I’d have said Bon Bonne for the sake of getting the three siblings covered together! Besides, I’m curious to see how his design evolved considering how odd it is. I decided I will continue with Bon on Monday (yes, actual Monday this time), and just throw Juno in today instead.